Sunrisers Hyderabad suffered a dramatic batting collapse to lose by 39 runs against Delhi Capitals in the Indian Premier League on Sunday. Chasing 156 to the do the double over the Capitals this season, Hyderabad were 101-2 at one stage in their reply with captain David Warner going well. However, they lost their last eight wickets in a hurry for 15 runs to be bowled out for 116, only Warner - who made 51 - and opening partner Jonny Bairstow (41) reaching double figures. Keemo Paul posted impressive figures of 3-17 while there were also a trio of wickets apiece for South African duo Chris Morris and Kagiso Rabada. 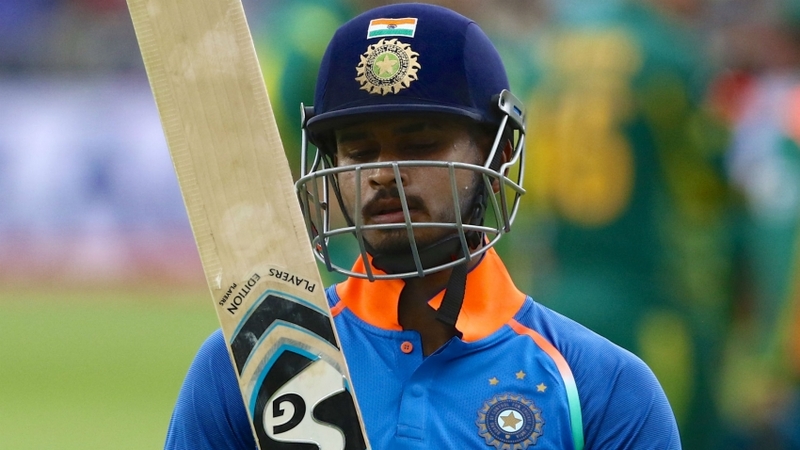 Earlier, Shreyas Iyer top scored for Delhi with 45, while Colin Munro was the only batsmen who managed to play fluently in the contest, making 40 from just 24 deliveries. The Capitals finished up on 155-7, a total their seam-dominated attack comfortably defended as they condemned the fading Sunrisers to a third successive loss. Delhi found the going tough after being asked to bat, not helped by Khaleel Ahmed dismissing openers Prithvi Shaw and Shikhar Dhawan cheaply. Leg-spinner Rashid Khan restricted the Capitals further during his impressive four-over stint, giving up only 22 runs while picking up the wicket of all-rounder Morris, who was bowled by a delivery that hurried through off the pitch. However, Munro's blitz - he scored 34 of his runs in boundaries - lifted the pace. Iyer's innings spanned 40 balls, while the usually aggressive Rishabh Pant was restricted to 23 from 19. While Warner and Bairstow put on 72 for the first wicket, Hyderabad's progress was steady rather than spectacular. Paul broke the stand when he tempted Bairstow with a slower delivery that ended up in the hands of Rabada in the deep, with the West Indies all-rounder following up with the dismissal of Kane Williamson. With the pressure building, Morris capitalised. The seamer claimed three wickets in an eventful 18th over as Hyderabad's chase fell apart, meaning they were bowled out with eight balls remaining. The impressive victory - their fifth in eight outings so far - moves Delhi up to second in the table. Rishabh Pant blasted a brutal unbeaten half-century to set up a 37-run Indian Premier League victory for the rebranded Delhi Capitals over Mumbai Indians at Wankhede Stadium. Pant smashed 78 not out from only 27 balls as the Capitals - formerly the Daredevils - made an imposing 213-6 in their first match of the tournament on Sunday. Colin Ingram (47) and Shikhar Dhawan (43) put on 83 for the third wicket after Mitchell McClenaghan (3-40) took two early scalps, then Pant struck seven sixes and as many fours in a devastating knock. Delhi took 99 off the last six overs, with Pant combining finesse and power in a breathtaking innings, which proved to be the difference. New signing Yuvraj Singh made 53 from 35 balls and Krunal Pandya added a brisk 32, but Mumbai were dismissed for 176 in the final over. Ishant Sharma took 2-34 and the excellent Kagiso Rabada 2-23 in a promising start to a new era for Delhi. Dhawan and Ingram put the Capitals well on their way to posting a daunting total after they were reduced to 29-2. It was the arrival of Pant that prompted the run-rate to rocket as the wicketkeeper-batsman delivered an exhibition of clean striking. Dhawan and Ingram both holed out to deep midwicket but Pant took the impetus, with Ben Cutting and Hardik Pandya dispatched to all parts. Pant continued to pepper the leg side and reached his fifty off only 18 balls, then set about Rasikh Salam in a penultimate over which cost 21 runs before Jasprit Bumrah was taken for 16 off the last. Ishant and Rabada kept it tight early in Mumbai's run chase and it looked certain that it would be Delhi's day when Rahul Tewatia took a stunning catch to remove Rohit Sharma. Tewatia came in from deep square-leg to get under a skier and clung on diving forward to see the back of the Indians skipper for just 14 in the fourth over. Shreyas Iyer ran out Suryakumar Yadav with a direct hit and Ishant sent Quinton de Kock on his way for 27 in the same over to leave the three-time champions with a mountain to climb. Yuvraj cleared the ropes three times in an entertaining knock but wickets tumbled too frequently, South Africa paceman Rabada dismissing the former India all-rounder and Cutting as Delhi eased to a comfortable victory. Quinton de Kock was in destructive form with the bat and Kagiso Rabada claimed his 100th ODI wicket as South Africa took a 2-0 lead in the five-match series against Sri Lanka courtesy of a dominant 113-run win. Having been put in by the tourists in Centurion, De Kock led the way for the Proteas with a typically aggressive 70-ball 94. However, though captain Faf du Plessis also hit a half-century, South Africa were bowled out for a modest 251. But the failures of De Kock and Du Plessis' team-mates were rendered immaterial as Sri Lanka folded miserably in what should have been a manageable chase, South Africa skittling them for 138 inside 33 overs. Victory means the hosts can secure revenge for their surprise Test series whitewash in Durban this weekend, when they will hope for a similar start to the one they enjoyed on Wednesday, as De Kock got them off to a flyer. He struck 60 in 46 balls in a 91-run opening stand with Reeza Hendricks (29), and he found another capable partner in Du Plessis, with whom he combined for 40 before Thisara Perera (3-26) robbed him of a hundred. De Kock hit 17 fours and a maximum, but an attempt to fire over short fine-leg went horribly wrong and he sent a leading edge to Niroshan Dickwella. Kasun Rajitha took a stunning catch to give Thisara the wicket of Rassie van der Dussen, and the same bowler removed Du Plessis, who failed with his attempt to pull a shorter delivery that kept low as the skipper departed for a 66-ball 57. South Africa had reached 220 by that point, but their innings fizzled out badly and ended with 29 balls to spare. Yet their struggles were minor compared to those of Sri Lanka, who saw Dickwella fall in the third over to Rabada (3-43), who reached his milestone by drawing a top edge that De Kock collected. Avishka Fernando and Kusal Perera soon followed and, though Oshada Fernando (31) and Kusal Mendis (24) offered hope with a stand of 40, things became bleak when that duo fell in successive overs. Horrible confusion between the pair saw Mendis run out, with Fernando then trapped lbw by Anrich Nortje. The writing was on the wall when Imran Tahir claimed the scalps of Thisara and Rajitha in the space of three deliveries, the tail surrendering meekly to put South Africa on the verge of a series triumph. South Africa closed to within 41 runs of victory in the second Test against Pakistan after a strong finish to a third day in which the tourists initially fought hard at Newlands. Pakistan had offered precious little with the bat in their first three innings of the series – scoring under 200 on each occasion – and they still had work to do in the field as play began on Saturday, the Proteas on 382-6 and leading by 205. Yet Mohammad Amir (4-88) took three early wickets as South Africa added just 49 runs and then Asad Shafiq made 88 and Shan Masood 61 for Pakistan. But the dismissal of Masood late in the second session gave the Proteas a much-needed boost and they made light work of the rest of the Pakistan side, with Dale Steyn (4-85) and Kagiso Rabada (4-61) helping to limit the tourists to 294. Pakistan's lead stood at just 40 runs, but Faf du Plessis' men ran out of time to get the job done and will now have to return on Sunday with what should be the simple task up wrapping up the three-match series. Amir made a flying start to the day as Quinton de Kock (59) edged to second slip before the stumps of both Vernon Philander (16) and Rabada (11) were uprooted in the same over. Some late boundaries were then halted when Shaheen Shah Afridi (4-123) tempted Steyn (13) to pick out third man, capping the Proteas lead at 254. Pakistan still looked to be in real trouble after another dismal start with the bat, falling to 27-2 after the dismissals of Imam-ul-Haq and Azhar Ali (both 6), but there was belatedly some good fortune for the tourists as two reviews went against Philander and the third-wicket stand reached 132. But Steyn made a timely intervention shortly before tea as Masood nicked behind, then Shafiq edged Philander to De Kock following the restart and Rabada caught and bowled Fakhar Zaman (7). Duanne Olivier collected the wicket of Sarfraz Ahmed (6) and Amir gloved Steyn behind for a duck, with a party atmosphere improved further as substitute fielder Zubayr Hamza caught Yasir Shah (5) at the rope. Babar Azam's resolute knock ended on 72 to Rabada, but Philander's dismissal of Mohammad Abbas (10 not out) – with Pakistan just 24 runs in front – was ruled out for a no ball and, although he made amends as he caught Afridi (14) off Rabada, there was no time for South Africa to begin their reply.